Happy Friday ladies! 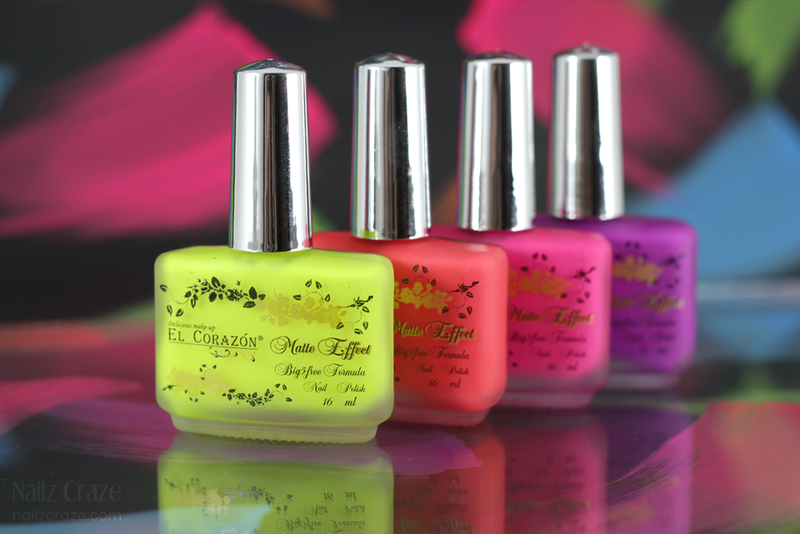 Today I have a fun and colorful post to share with you, featuring four colors from the Matte Effect Neon collection by El Corazon. I thought I'd better have some neons on the blog before summer is over, right? So let's see what these matte neons are all about! 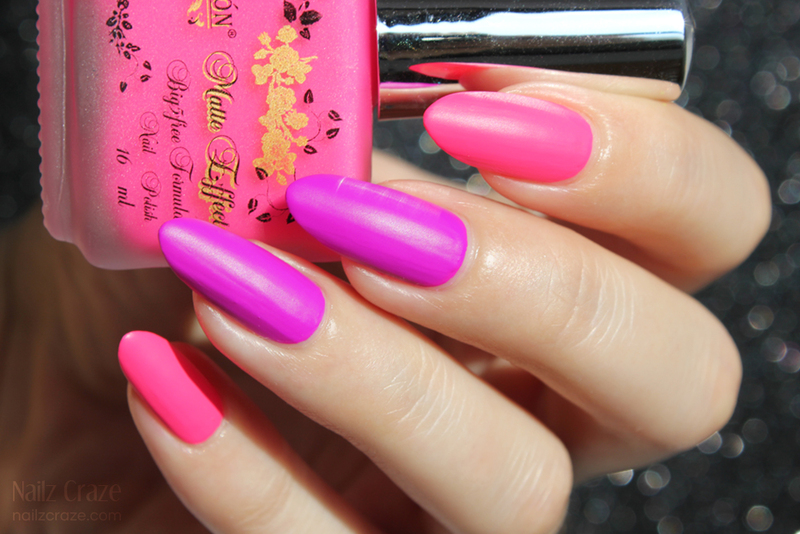 The Matte Effect Neon collection consists of 7 bright neon colors with a velvety matte effect. Unlike many other neon colors, their formula opaque on it's own and they don't require a white base coat to enhance their color and opacity, which was a pleasant surprise! Among the four colors I got, the yellow neon had the least opaque formula, but still was completely opaque with only two coats. The formula of this collection dries quickly and reveals the matte effect fast, and like with most matte nail colors, you will need to work quickly while applying the nail polish to avoid streaky lines. 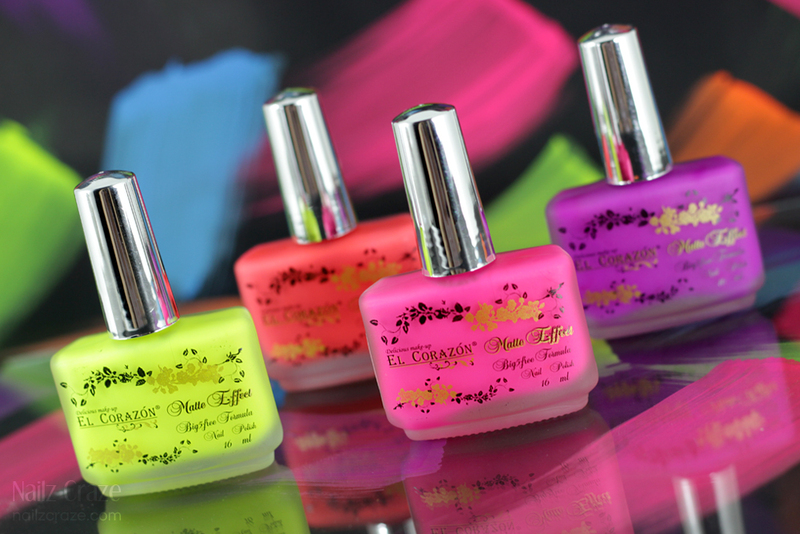 Overall I really loved this collection; I think the formula is superb with these neons, the colors are bright and vibrant, and the lovely matte glass bottles are adding a nice touch. Below is El Corazon Matte Effect Neon 141 (yellow) and 143 (orange) in two coats. I think these two colors work so nice together, and although orange is a color I wouldn't usually enjoy, I really loved this neon version. Below I have two coats of El Corazon Matte Effect Neon 144 (pink) and 147 (purple). The purple shade is my favorite from the four because it's color is so fabulous and the formula is super opaques and could even go with one coat alone. 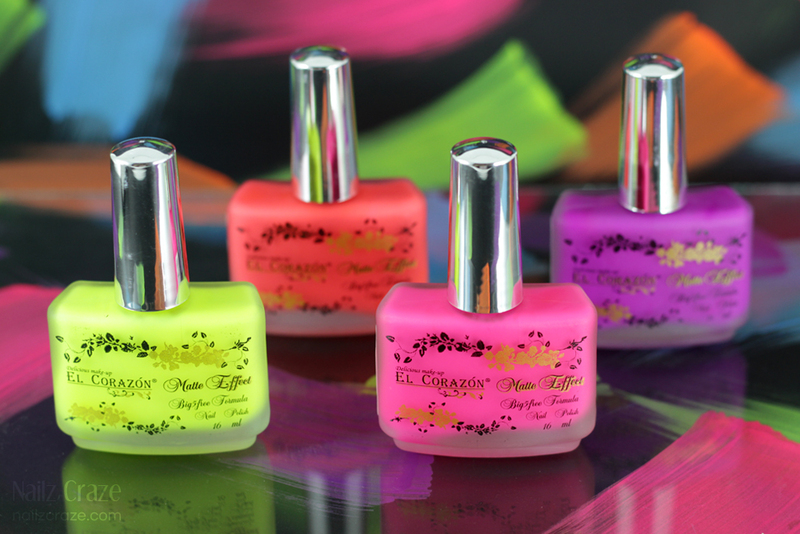 El Corazon Matte Effect Neon (L-R) 141, 143, 144, 147. You can see all of the colors in this collection at this link, and also see the swatches here. Hope you enjoyed this post and that these neons will brighten your day! Let me know which color out of these four is your favorite! Those polishes are so pretty! BEAUTIFUL photos of these, and wow- those bottles are really cute! Especially all together! These are all awesome! I have one polish from the matte effect line, but I think it's an older one, because it isn't neon, but they are seriously awesome. So awesome I think I'll have to add those neons to my collection! Lovely photos ! these look super fun!